Today I got an email from a teacher who mentioned a colleague had been using some of my instructional materials for years - but they thought the site they came from was down, and did I know where those materials were now? They are/were called "Task Cards". What a flashback. Those task cards are on Project Athena, funded by a NASA grant. Man, those were heady times. The fact that the site endures, and is used, over a dozen years later, astounds me. It speaks to the quality and vision of the project creators - and to the capability that we have to keep ANYthing of value - forever. The image here is one I developed in response to what I (and a couple of others) thought was a less than adequate design for the home page. Aaack, politics are here forever. The page lives on in my school's website here. I haven't used the site (or the materials I developed for it) in my third grade classroom for 6 or 7 years. Serious personal and educational whiplash. Isn't technology and a connected world great! I was so psyched to see mention of my request for the Athena Project files cited in your blog. If I am excited about reaching out to another educator and being acknowledged, how can we doubt that our kids will be excited and engaged when they reach out to others (including experts) through blogs, wikis, voice thread, etc? Unfortuantely, teachers have such an overwhelming job to do and get so caught up in "content" (important, of course)and assessment and testing and dealing with multiple personalities on every given day that it becomes hard to try new things with technology. Thanks so much to educators like you who have tried and tested projects to inspire us to embrace more collaborative projects. Thanks much for your comments - and thanks for bringing to my attention the Project Athena links not working. 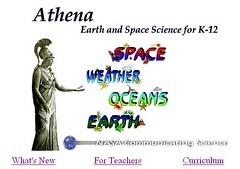 Athena has been hosted several places the past few years, and all the links to it from my school page were out of date - until you pointed it out. As for your "ramblings" - ha - yes, the laptops I'm experimenting with this year are amazing. I have heard about the 1:1 laptop thing in Maine, and I think it is truly fantastic. And yes, Bob Sprankle has been an inspiration to me for a long time.